In the fast-paced world of digital marketing, businesses don’t have time to waste on admin. WhosOff is enabling award-winning UK agency Evoluted to create a sustainable leave management process that supports the company’s continued growth. It’s the ideal solution for modernising staff leave management. Sheffield-based digital design, web development and full-service marketing agency, Evoluted, has been consistently expanding since it was founded in 2006, and now employs 29 permanent staff. By 2014, the company was struggling to manage staff leave through its old, manual systems, and wanted to find a more effective way to communicate who was available at each point in time. Originally we used a board in the office to track who had holiday coming up, but it became increasingly difficult to make sure this was accurate,” explains Evoluted’s Content Manager, Sean Potter. “It became obvious that we needed an online system for managing leave, which could be viewed by the whole team – even when they weren’t in the office. An online search directed Evoluted to WhosOff and the company was quickly convinced of its benefits, trialling the solution before training the entire agency to manage their leave online. One of Evoluted’s major motivations for improving leave management was client continuity. It handles a number of specialist development projects, which require a specific set of skills. The agency needs to feel confident that sufficient staff are available across the business to meet its clients’ complex needs, and that annual leave will not impact project deliveries. WhosOff was a no-brainer for us, as everyone can easily access the system and see each other’s availability,” advises Sean. “It’s a very flexible platform that we can use to plan workload in both the short-term and for the year ahead, particularly when we have projects where staff with a certain skillset are required. Being able to view staff leave at a glance enables Evoluted to keep clients up-to-date with who has holiday coming up, arranging an alternative point of contact in their absence. Nobody is caught off guard this way, and clients are reassured that they will have access to the right people at all times. This level of transparency is particularly helpful if staff are taking longer periods of annual leave. Another critical feature that converted Evoluted to WhosOff is an intuitive user experience. Staff at Evoluted are entitled to 25 days’ paid holiday plus Bank Holidays, and they are encouraged to use their full entitlement. WhosOff empowers the team to manage that leave independently, with managers able to respond to requests quickly. Being a digital agency, Evoluted staff are quick to grasp new technology and so quickly adapted to managing their annual leave entitlement via an online system. WhosOff’s intuitive dashboard means minimal training was required. It’s not just client expectations that are now managed more effectively at Evoluted; WhosOff has proved critical for managing internal communications and working processes. There is a high level of collaboration between staff, who can now get a clear overview of who’s in the office each day by looking at the WhosOff dashboard. 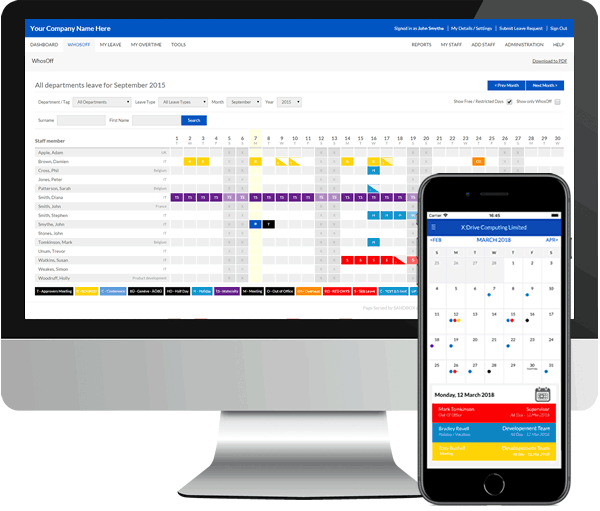 Centralising staff leave management helps the Evoluted team to schedule meetings, as personnel can refer to WhosOff to check availability before putting time in people’s calendars – rather than launching into a complex email chain every time they want to schedule a catch-up. “If we’re planning a departmental meeting, it’s the first thing we turn to,” says Sean. Having a central way to record availability has directly influenced the company’s remote working policy as well. Evoluted encourages staff to work from home two or three days a month, which is colour coded differently on WhosOff from annual leave bookings. Being able to track home working days in the same place as holiday requests means team members who are in the office can see why someone is absent. Five years after first using WhosOff, the solution is now firmly embedded into Evoluted’s office culture – and continues to deliver benefits to the business. "WhosOff saves a lot of our HR team's time, it is an asset to our business"
"Excellent system which I have used it at two companies now. As soon as I started at my current company, this was one of the first systems I insisted on implementing"
"We now have greater accessibility across shifts with increased accuracy and visibility"